The healthy Schools began the construction stage of the project on the 30th of January with the school at Plan Grande , Huehuetenango, Malacatancito. The healthy Schools 2012 began the construction stage of the project on the 30th of January with the school at Plan Grande , Huehuetenango, Malacatancito. 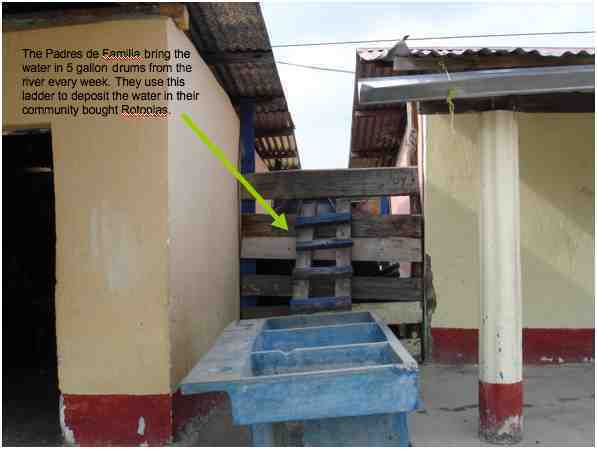 The school hand washing station and rain storage tank was finished on the 10th of February. The village and teachers cooperated very well and the masons from Agua Para La Salud encountered no problems with the construction. The village parents will fill the tank each week during the dry season so that the children will have water to practice hygiene habits. The next stage of construction in the municipality of Jacaltenango, Huehuetenango will start on the 13th of February with the construction of 4 hand washing station. These will be finished by the 24th of February. The project was completed without problems. The community cooperated well. The school now has a place for the parents to fill with water each week during the dry season and use the roof for rain collection during the rains. The school now has a focal point for the teachers to train hygiene habits.